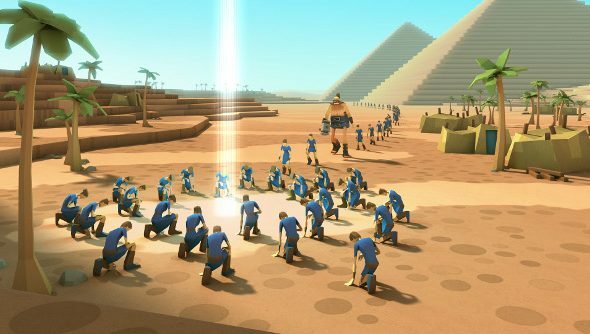 Designer and Godus co-creator Jack Attridge is moving on, leaving behind the troubled god game and its equally troubled developer, 22Cans. As Peter Molyneux’s number two, he seemed like the heir apparent, but he’s ready “to steer his own ship” now, he told The Guardian, not further down the line. The timing of the announcement makes it look like a reaction to some rather explosive criticism in February, which then led to emotional interviews with Peter Molyneux resulting in the veteran developer swearing off interviews entirely. Indeed, he said he’d never speak to the press again. It looks that way, but Attridge assures that this isn’t the case. The break up has been an amicable one, Attridge explained. And he had nothing but positive things to say about his ex-boss and mentor. Attridge’s new project has, so far, spawned a tech demo, but he’s keeping that under his hat for the time being, no doubt learning from Molyneux’s frequent mistakes when it comes to over-promising and under-delivering. Before he left, Attridge put together a documentary about 22Cans, spanning the birth of the studio up until the events of February this year. It will be made available to Godus backers soon.